It’s party time! Feel the beat in your heart with Electronic Ringtones - Free Ringtone App made for all the fans of electronic music around the world. This is a great collection of electronic sound effects put in one place for all the fans of good rhythm. 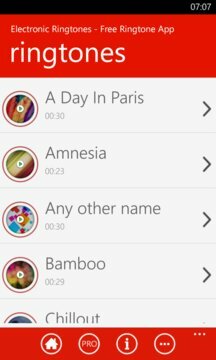 If you like listening to the electronic musical instruments, especially the electric guitar, you will certainly be happy to have Electronic Ringtones application. It’s good the coolest guy in your company when your phone is ringing. Find your favorite melody among the top electronic music sounds and set it as a ringtone or as alarm to wake up fresh and get ready for the new day. There are many electronic music genres to choose among, play chill out music if you want to relax and imagine you are somewhere on the beach. Play electro house music if you feel like dancing. These ringtones are made from best electronic music! Now you don’t need a DJ to listen to good sounds because these electro sounds will make you move your body and cheer you up. 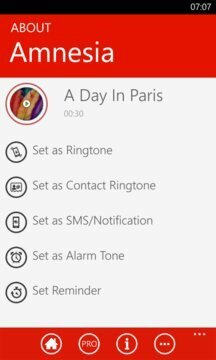 Sound clips used in Electronic Ringtones - Free Ringtone App for Windows Phone are under public domain license and/or Creative Commons’ license.